an opaque, grayish ring at the periphery of the cornea just within the sclerocorneal junction, of frequent occurrence in the aged; it results from a deposit of fatty granules in, or hyaline degeneration of, the lamellae and cells of the cornea. an opaque ring, gray to white in color, that surrounds the periphery of the cornea. It is caused by deposits of cholesterol in the cornea or hyaline degeneration and occurs primarily in older persons. See also gerontotoxon. 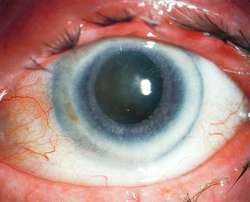 An opaque, grayish ring at the periphery of the cornea just within the sclerocorneal junction; frequent occurrence in old people; it results from a deposit of fatty granules in, or hyaline degeneration of, the lamellae and cells of the cornea. Synonym(s): anterior embryotoxon, arcus cornealis, gerontoxon. A white ring near the outer margin of the CORNEA. This is a normal feature of age and is of no significance. Vision is never affected. A greyish-white ring (or part of a ring) opacity occurring in the periphery of the cornea, in middle and old age. It is due to a lipid infiltration of the corneal stroma. With age the condition progresses to form a complete ring. That ring is separated from the limbus by a zone of clear cornea. The condition can also appear in early or middle life and is referred to as arcus juvenilis (or anterior embryotoxon); it is somewhat whiter than corneal arcus. Arcus juvenilis is often associated with heart disease in men (Fig. C19). Syn. arcus senilis; gerontoxon. See marginal furrow. An opaque, grayish ring at the periphery of the cornea just within the sclerocorneal junction; frequent occurrence in old people. n an opaque, grayish-white ring at the periphery of the cornea occurring in older adults. 0 1 (0-2) 1 (1-2) Xanthalesma, n (%) 11 (23) 74 (45) Arcus senilis, n (%) 3 (6) 7 (4) Earlobe crease, n (%) 18 (38) 84 (51) Hair thinning, n (%) 9 (19) 23 (14) Medications ASA / Clopidogrel, n (%) 17 (35)/0 (0) 76 (46)/10 (6) Statin, n (%) 5 (10) 48 (29) ACEI / ARB, n (%) 8 (17)/9 (19) 50 (30)/30 (18) BB, n (%) 15 (31) 59 (36) CCB, n (%) 3 (6) 18 (11) OAD/Insulin, n (%) 0 (0) 18 (11) Nitrate, n (%) 3 (6) 21 (13) Variables * p Age, years NS Height, cm NS Weight, kg NS BMI, kg/[m.
A YOU have arcus senilis, which is a deposition of fat around the iris. Why is my life such a wheeze?